Un film di Steven Spielberg. Con Harrison Ford, Karen Allen, Cate Blanchett, Shia LaBeouf, John Hurt. 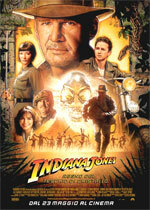 Titolo originale Indiana Jones and the Kingdom of the Crystal Skull. Avventura, Ratings: Kids+13, durata 125 min. - USA 2008. - Universal Pictures uscita venerdì 23 maggio 2008.